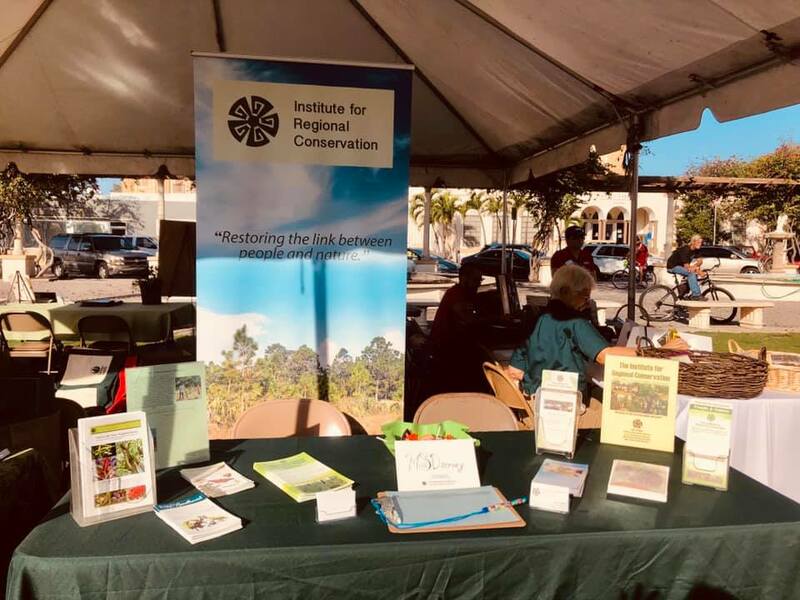 IRC's Samantha Gabriel attended the 14th Annual Lake Worth Festival of Trees and discussed our Green Delray and Restoring the Gold Coast programs, as well as our Natives for Your Neighborhood website. Restoring the Gold Coast program is a two-pronged project that mobilizes partnerships in theSouth Florida community to teach children and adults about environmental advocacy and the importance of biodiverse coastal uplands, while participating in hands-on restoration activities. By then end of the 1970s almost the entire dune from Key Biscayne to West Palm Beach had eroded into the sea, and along with it most of the coastal biodiversity of southeastern Florida. While sandy beaches have been re-nourished, sea-oats have been planted and turtle nests protected, the vast diversity of coastal uplands has remained in a depleted state. Restoring the Gold Coast seeks to restore much of that lost diversity, through a cooperative effort with stakeholders, volunteers, and restoration experts. Ultimately, this project will take place in the historic Gold Coast barrier islands in Miami-Dade, Broward and Palm Beach counties. Over the past few months, IRC has worked to develop the conceptual framework for this initiative and prepare a $100,000 proposal to Palm Beach County Impact 100, in hopes of gaining critical financial support for this project in southern Palm Beach County. We are grateful for the interest and letters of support from the community, including the Beach Property Owners' Association, City of Boca Raton, City of Delray Beach, Fairchild Tropical Botanic Garden, Gulfstream School, Keep Palm Beach County Beautiful, and Town of Briny Breezes. We also thank Jerry Lower of the Coastal Star, Bill Petry, and Kimberlee Duke Marshall of the Ocean Ridge Garden Club for helping us drum up interest and support. Please consider making a contribution to support this important effort, and wish us luck with our proposal to Impact 100! 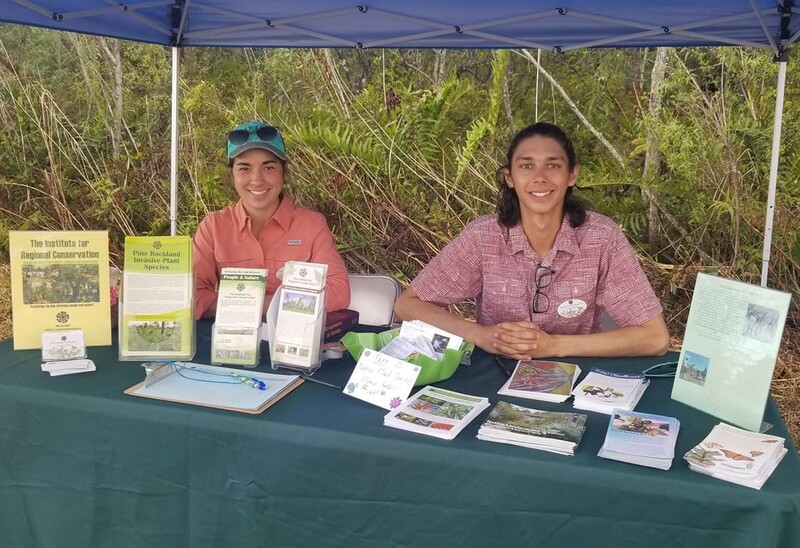 IRC's field biologist, Michelle Smith, and crew member, Louis Castillo, attended the 20th Annual Everglades Day at Loxahatchee National Wildlife Refuge and discussed our work on pine rockland habitats and the importance of restoration of upland habitats in the Greater Everglades Ecosystem. 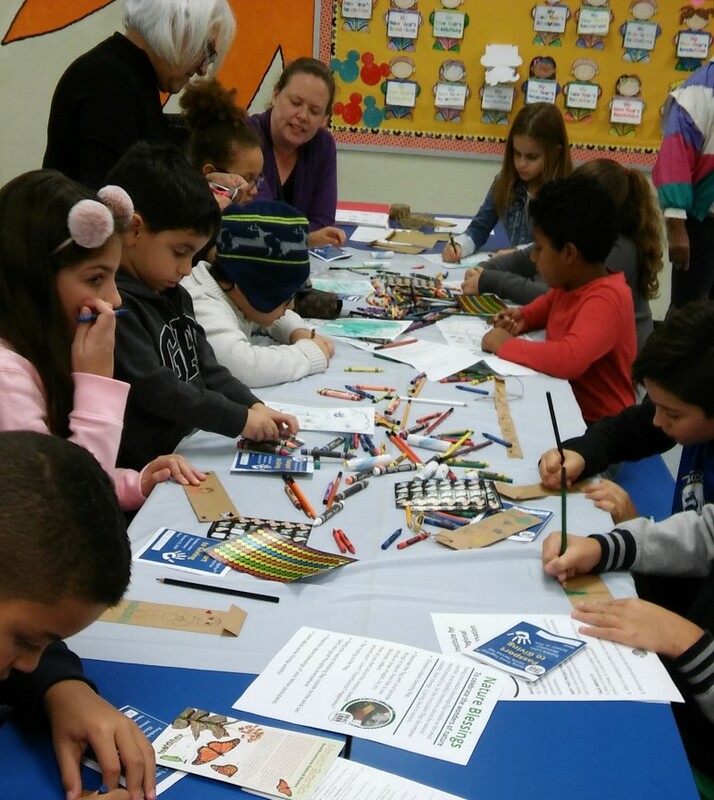 IRC Research Associate and entomologist, Sandy Koi, attended the "Doing Good Together" program at Miami Lakes Elementary School. "Doing Good Together" is a Minnesota-based program that brings children together to do fun projects that help the local community. This is the second year IRC has participated; this year Sandy (who also does art work) provided two paper projects about conservation for the children to take home. One project depicted a tree and the animals who use the tree for food and shelter, and the other entailed the children drawing "Blessing Flags" for the things that the Earth provides for us. Similar to Tibetan "prayer flags", these biodegradable paper flags are meant to be hung in one's back yard to let the wind carry the blessings around the world. IRC's Chief Conservation Strategist, George Gann, presented to the Silver Palm Garden Club and the Royal Poinciana Garden Club on January 23rd about 'Going Native'. George discussed the history of IRC's work on the Floristic Inventory of South Florida, Natives For Your Neighborhood, and our other free resources available on our website! He also went on to describe what is considered native and how anyone can 'Go Native'. To see the full powerpoint presentation, click here. IRC's Chief Conservation Strategist, George Gann, presented to the Seranoa Chapter of the Florida Native Plant Society and the Marie Shelby Botanical Garden on January 21st about 'The Promise (and some perils) of Ecological Restoration. George discussed the history of efforts towards restoration, what ecological restoration really is and how it effects biodiversity and ecosystems both globally and within Florida. To see the full powerpoint presentation, click here. IRC Brings on New Field Crew Members to Team! Recently, IRC has brought on three new field crew members onto the team, Louis Castillo (Left), Sarah Solomon (Center), and Benjamin Durrington (Right)! Louis has a degree in Environmental Science from FSU and has experience with restoration work, native plants, and managing gardens. 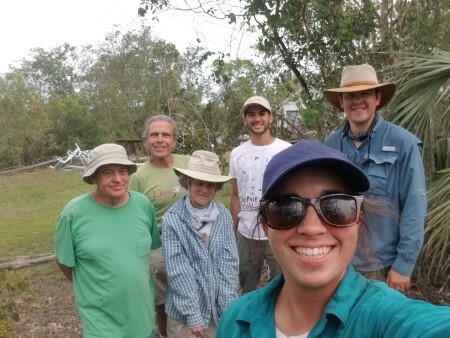 Sarah has a degree in Environmental Engineering from FIU, has experience with native plants, and has participated in past volunteer days with IRC. Benjamin has a Master's degree in Ecology from Sorbonne Universite in Paris, France, has a love for plant macrophotography, and has experience with plant identification. 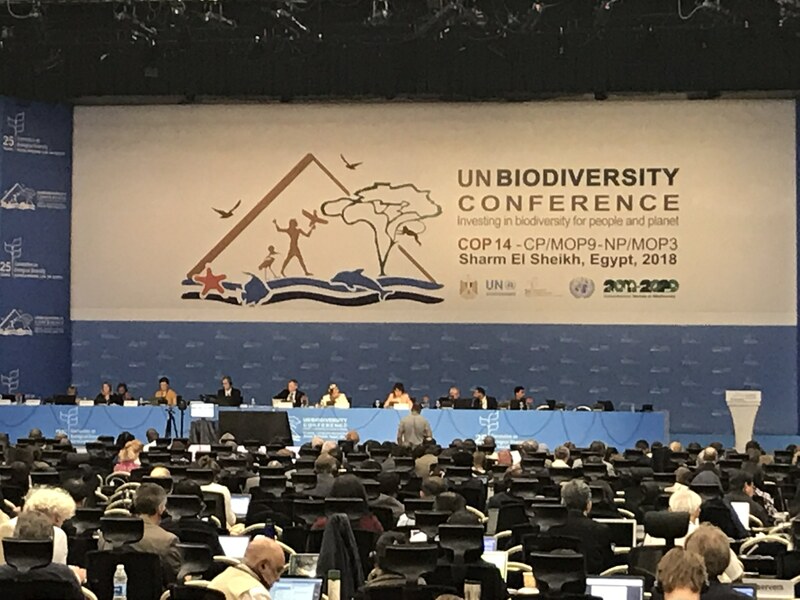 IRC Participated the UN Biodiversity Conference in Egypt! IRC's Chief Conservation Strategist, George Gann, participated in the UN Biodiversity Conference in Egypt in mid-November as part of a delegation from our partner, the Society for Ecological Restoration. George presented on the Convention on Biological Diversity’s Short Term Action Plan on Ecosystem Restoration, used by countries around the world. Last Lake Ida Volunteer Day in 2018! We recently had our last scheduled volunteer day at Lake Ida Parcel! Even with our small group, we were able to remove a large amount of invasive Richardia, take down some Earleaf, and plant about 300 native grasses. For more pictures, check out our Facebook! A special thanks to Community Foundation for Palm Beach and Martin Counties for funding this project, Delray Beach Parks & Recreation for coming out to work with us, and to our boating chauffeurs Iain Patterson, John Miller, & the boys. We would like to thank every volunteer that has come out to one or more of our events! We couldn't have done this without your hard work and support. A special thank you to our recurring volunteers who came to every event and provided us with their boats! IRC held this event to give private landowners the opportunity to share their successes and the challenges of owning a pine rockland. Our goal is to work as a community to help get the funding and technical support needed to restore and manage these forests. This event was funded by the U.S. Fish & Wildlife Service's Partners for Fish & Wildlife Program, and was organized in conjunction with the Fairchild Tropical Botanic Garden's Connect to Protect Network. 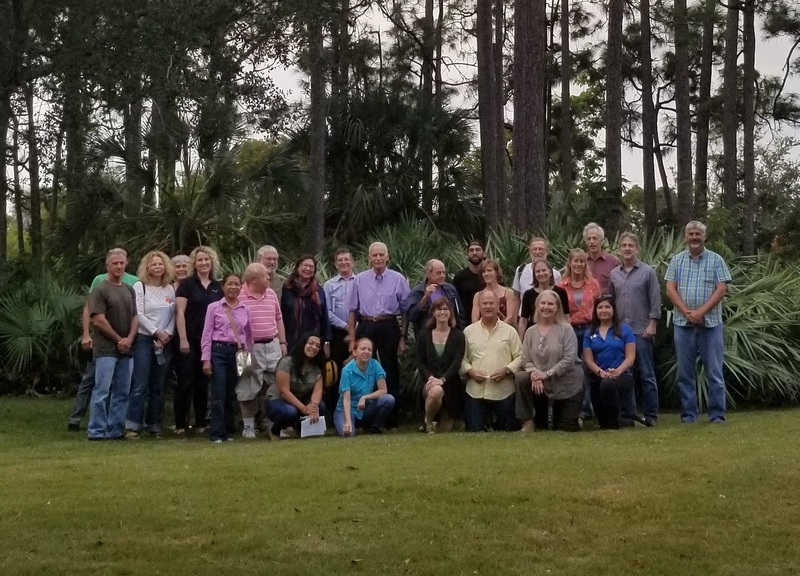 Our Chief Conservation Strategist, George Gann, was the keynote speaker at the Pine Rockland Working Group Conference at Fairchild Tropical Botanic Garden. George talked about Expanding the Pine Rockland Footprint – To Protect We Must Restore. This presentation explored the idea that, in order to save pine rocklands, we have to restore pine rocklands – from fire suppressed “transitional” forests to bulldozed sites and even farm fields. George wanted to raise awareness that we not only need to restore these damaged habitats, but work with the community to gain the support and resources needed to do this properly! 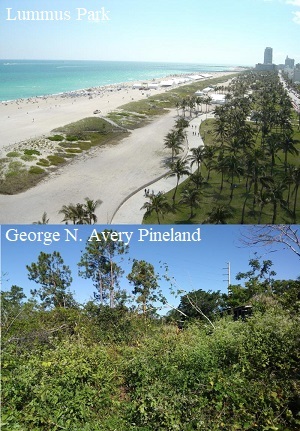 Pine rocklands are a globally imperiled ecosystem known only from South Florida, the Bahamas, and Turks and Caicos. 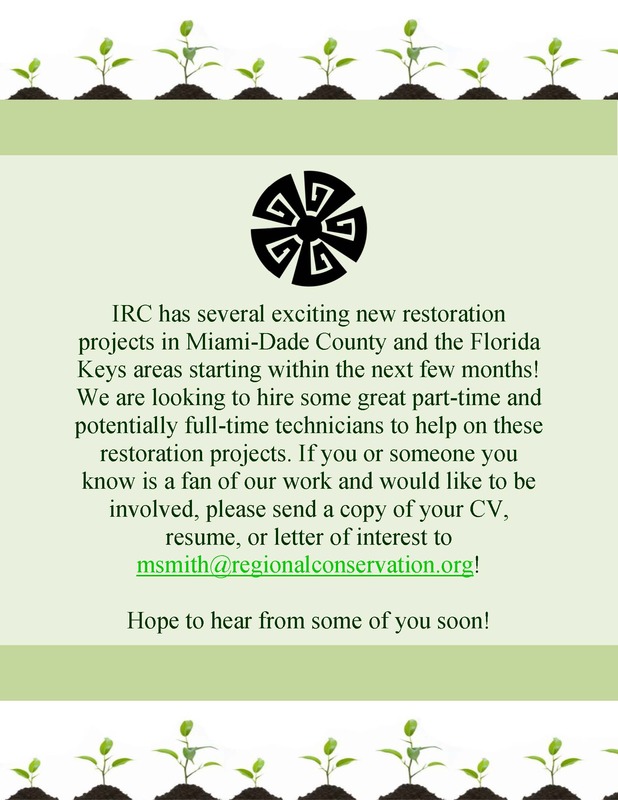 IRC has several exciting new restoration projects in Miami-Dade County and the Florida Keys areas starting within the next few months! We are looking to hire some great part-time and potentially full-time technicians to help on these restoration projects. If you or someone you know is a fan of our work and would like to be involved, please send a copy of your CV, resume, or letter of interest to Michelle Smith at msmith@regionalconservation.org! Please share with anyone who might be interested! Support IRC in Give Miami Day 2018! IRC will be participating in this year's Give Miami Day all day on Thursday, November 15th! 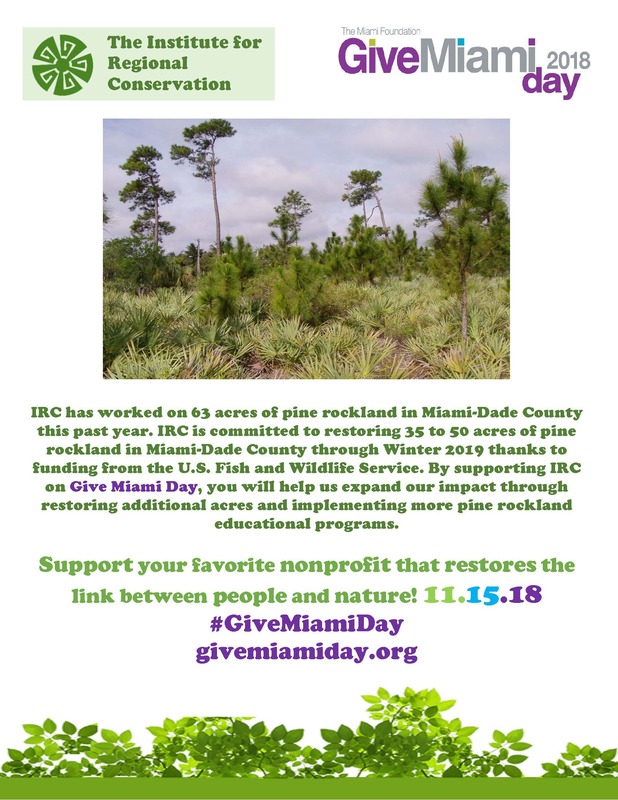 Help support IRC's restorative work on pine rockland habitats in Miami-Dade county on this day. We will be posting reminders closer to the day and on Give Miami Day! You can either donate through the Give Miami website or use the 'Donate Give Miami Day' button that will be available on our website. Donations for this particular event can only be made on the day, November 15th. Be a part of a great way to support and acknolwedge your favorite non-profit organizations! Click here for more info on Give Miami Day 2018. IRC's 5th Lake Ida Parcel Volunteer Day a Success! Thank you to everyone who came out on Saturday to continue our work for the 5th volunteer day on Lake Ida Parcel! We planted about 80 native plants, removed some invasive Earleaf acacia, and picked up some trash on the site. For more pictures, check out our Facebook! A special thanks to Community Foundation for Palm Beach and Martin Counties for funding this project, Delray Beach Parks & Recreation for coming out to work with us, Indian Trails Nursery for providing the beautiful native plants, and to our boating chauffeurs Iain Patterson, John Miller, & the boys. Atlantic Dunes Park Volunteer Day with Conduent Foundation! 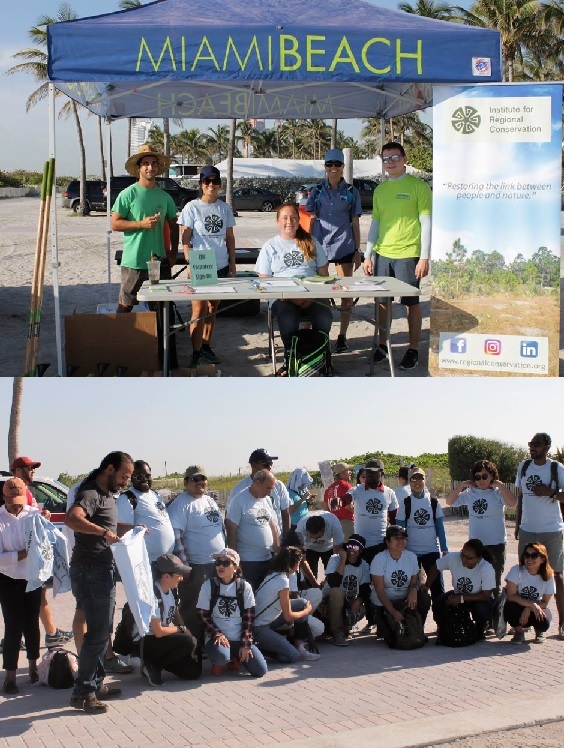 Thank you to everyone who came out to Atlantic Dunes Park in Delray this weekend to help IRC continue our restoration efforts at this beautiful park! Volunteers removed a large patch of Beach naupaka (Scaevola taccada), some Brazilian-pepper (Schinus terebinthifolius) and some Bowstring-hemp (Sansevieria hyacinthoides). In the area where Scaevola taccada was removed, volunteers planted 200 Sea-oats (Uniola paniculata), a few Tropical sage (Salvia coccinea) and Beach clustervine (Jacquemontia reclinata). We would like to thank the Conduent Foundation for awarding IRC a mini-grant which allowed us to organize this restoration event! For more pictures, check out our Facebook! Lummus Park Volunteer Day #2 a Success! 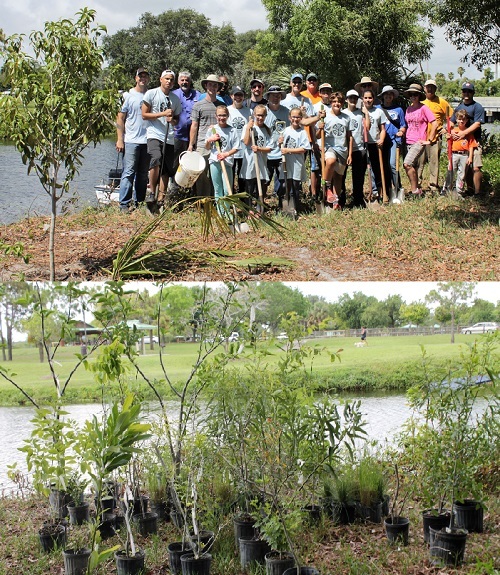 Thank you to everyone involved in last week’s restoration volunteer day at Lummus Park! Volunteers helped IRC plant 700 native plants in the dunes of Lummus Park in areas where we removed invasive Beach naupaka (Scaevola taccada). We would like to give a huge shout out to our sponsors, the Dade Chapter of the Florida Native Plant Society and TreeMendous Miami. If you haven’t already done so, sign up for their email lists to receive information on the wonderful work these organizations are doing! We would also like to thank the City of Miami Beach for their help in organizing and funding this event. For more pictures, go to our Facebook here! IRC's George Gann Presents at NatureScape Broward! IRC's Chief Conservation Strategist, George Gann, gave a talk during the NatureScape Broward Meeting about climate change on Tuesday, September 18th. George discussed the issue of climate change and the effect it has on native plants and ecosystems. To see the full powerpoint presentation, click here. Volunteer Day #4 at Lake Ida was a Success! Thank you to our 30+ volunteers that came out to the Lake Ida Parcel Saturday morning! Our biggest turnout at Lake Ida yet! Volunteers helped us by planting almost 300 native plants, removing some invasives, and opening up some areas for the planting. We are thrilled with the progress made so far at the site and are looking forward to our next two volunteer days coming up this year! Once again, we'd like to give a special thank you to the Delray Beach Parks & Recreation for all of their help organizing and running the events, Community Foundation for Palm Beach and Martin counties for funding this project, Patty Caballero from The Natives Inc. for providing the plants, and to John Miller and Iain Paterson for being our wonderful boating chauffeurs! Camp Choee Girl Scout Volunteer Day! 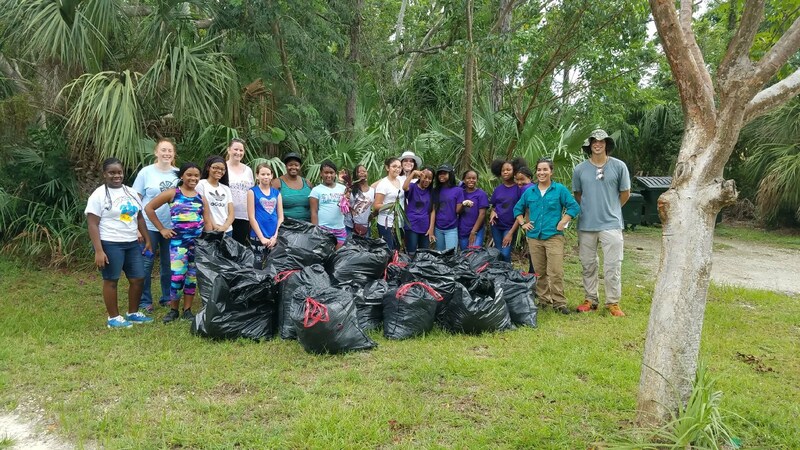 A volunteer day at Girl Scouts of Tropical Florida’s Camp Choee site was led by IRC’s Field Biologist, Michelle Smith, Education & Outreach Coordinator, Cara Abbott, and Crew Leader, Ruben Sola. They gave a short presentation on pine rockland ecosystems, restoration and conservation issues, invasive plants in pine rocklands, and native butterflies and moths of pine rocklands. The Girl Scouts reviewed the invasive plants that were displayed and conducted a scavenger hunt at the Camp Choee pine rockland site. They also kept an eye out for the butterflies and moths. For the Girl Scouts to earn the “Clean Jeans” patch, we had them remove invasive plants from the pine rockland. They removed 20 trash bags worth of Oysterplant from the pine rockland (Tradescantia spathacea)! IRC Welcomes a New Board Member! Allison Turner, owner and CEO of BCoSF Media and Business Consultants of South Florida (BCoSF), is a resident of Delray Beach, Florida and brings over 25 years of experience in a variety of industries where she honed her skills in management, customer service, event planning, marketing, and communications. At BCoSF, she brings her passion for creativity, finance and management to the company. Using her drive for perfection and time management skills that she learned as a Division I College Athlete, she brings consistency, focus and passion to her work with businesses. 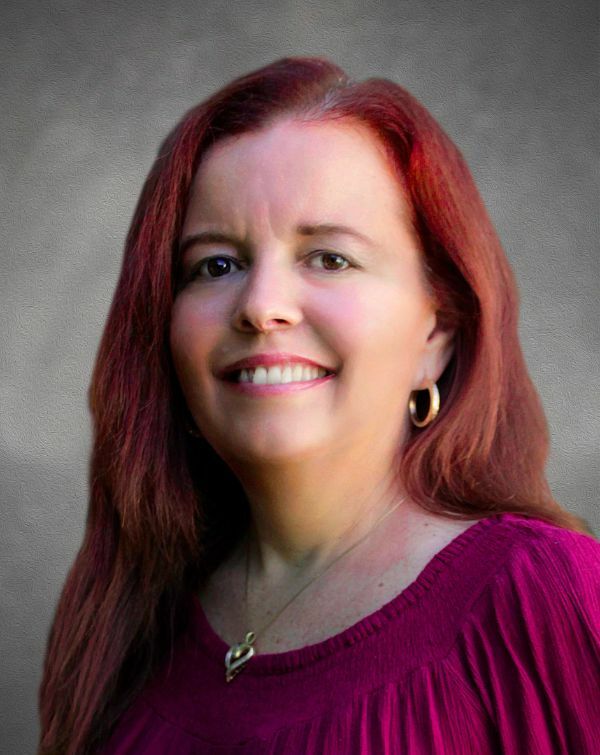 She oversees two divisions of BCoSF, Business Consultants of South Florida and BCoSF Media, which houses the branding, website design, online marketing services and video production. Allison stated, “I’m excited to be joining the board for The Institute for Regional Conservation. Their research and work is definitely something I am passionate about and I look forward to helping the organization grow and build its resources and name.” Welcome to IRC, Allison! 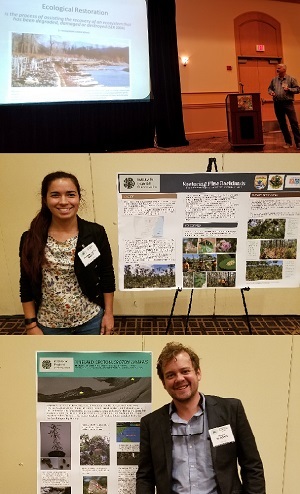 IRC Presents at the 2018 FNPS Conference! IRC’s Chief Conservation Strategist, George Gann, presents a talk as a featured speaker during the 2018 FNPS Conference titled ‘The Promise (and some perils) of Ecological Restoration’ on Friday, May 18th. The talk was well attended and resulted in a great discussion with the attendees about ecological restoration, global restoration initiatives, restoration targets, novel ecosystems, mitigation, reforestation, and more. To view the presentation, click here. IRC’s Field Biologist, Michelle Smith, presents a poster at the 2018 FNPS Conference titled ‘Restoring Pine Rocklands’ on Friday, May 18th. Michelle discussed with attendees about IRC’s work with other agencies to restore and manage Pine Rockland habitats in Miami-Dade and Monroe counties. Pine Rocklands are globally imperiled habitats that are being restored by treating and removing non-native, invasive plants and native hardwood plants using herbicide and mechanical treatment. To view the poster, click here. IRC’s Field Biologist, Alexander Blochel, presents a poster at the 2018 FNPS Conference titled ‘Pineland Croton, Croton linearis’ on Friday, May 18th. 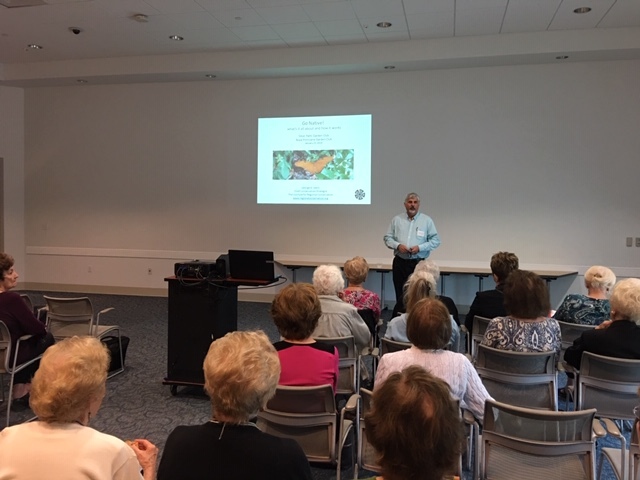 Alex discussed with attendees about IRC’s work with the USFWS Cooperative Recovery Initiative to prevent the extinction of Bartram’s scrub-hairstreak (Strymon acis bartrami) and Florida leafwing (Anaea troglodyta floridalis) butterflies in the lower Florida Keys. With the help of volunteers, IRC has been planting 6,000 Crotons throughout the refuge to benefit both the plant species itself and the wildlife it supports.To view the poster, click here. Private Pine Rockland Volunteer Day was a success! Thank you to those who came out to our private pine rockland volunteer day last Friday! Hosted by the private pine rockland owners, our two field biologists, Alex Blochel & Michelle Smith, worked with the volunteers to pull and bag oyster plant, cut Gold Goast jasmine, and cut large oak trees to open up the area. We bagged approximately 10 bags of oyster plant! Thank you to the owners for allowing us to host this volunteer day and a special thanks to our board member Patty Phares for joining us! For more pictures from the volunteer day, click here. Lake Ida Volunteer Day 3 a Success! Thank you to everyone who came out to the Lake Ida Parcel Saturday morning! Volunteers helped us by planting over 20 different species of native plants on the site. For a full plant list, check out our post on Facebook! We are thrilled with the progress made so far at the site and are looking forward to how much more we can accomplish in the next year! Click here for more photos from the event. Once again, we'd like to give a special thank you to the Delray Beach Parks & Recreation for all of their help organizing and running the events, Jane Thompson from Indian Trails Native Nursery for providing the plants, and to John Miller and Iain Paterson for being our wonderful boating chauffeurs! Lummus Park Volunteer Day was a success! 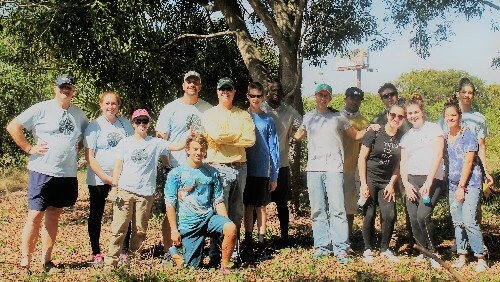 Our Restoration Volunteer Day at Lummus Park on April 20th was a huge success! Volunteers from 20 countries and 4 continents helped IRC remove several large patches of Scaevola taccada, plant over 250 sea oats, and remove dozens of garbage bags worth of trash and microplastics from the beach. We would like to thank the City of Miami Beach for all of their help and funding for this event. We would also like to thank Starbucks and Global Ties Miami for bringing such wonderful groups of volunteers! 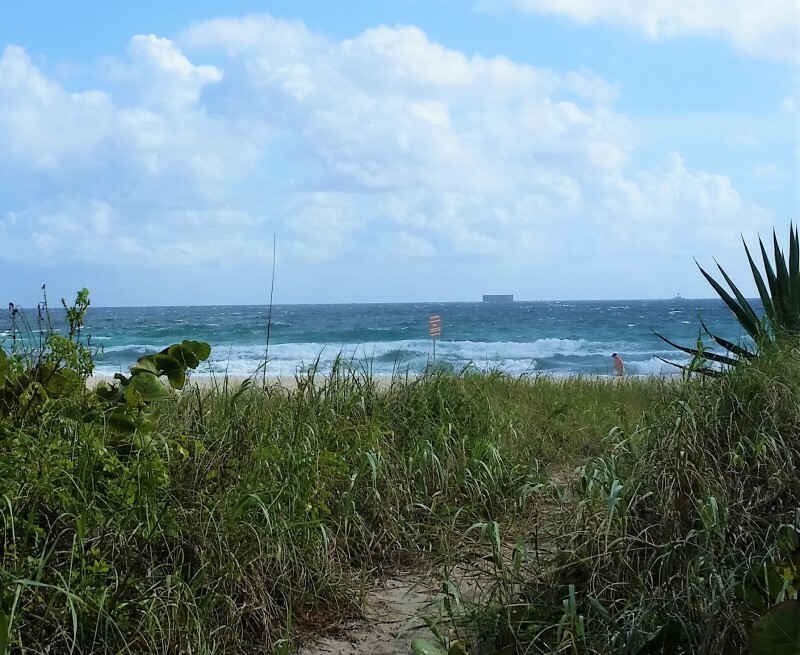 Kick off Earth Day Weekend with IRC on Friday April 20th from 9am - 12pm by restoring a portion of Lummus Park, a beach front park in South Beach. Volunteers will help IRC plant native species and pick up trash at the park. For more information, click here. Volunteers needed at George N. Avery Pineland for a restoration day! This site is one of many that IRC is currently working on restoring. Volunteers will help IRC restore this site by removing invasive ferns and other restoration work. For more information, click here. IRC would love to have you join us at these restoration events! Please remember that we advise all volunteers to wear close-toed shoes and long pants! You can RSVP with us at or call the number provided in the links! Lake Ida Parcel Volunteer Day 2! Back at it again! 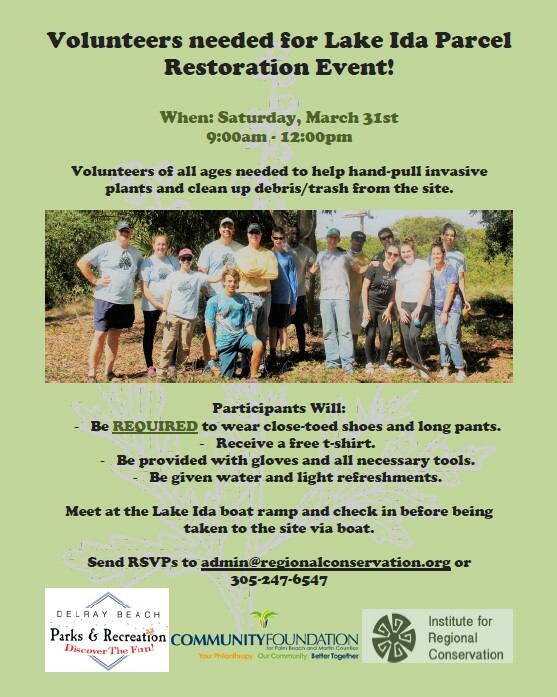 IRC will be holding our second Lake Ida Parcel volunteer day at the end of this month, on March 31st at 9:00am-12:00pm. Volunteers will help IRC to continue to restore this important greenspace by removing invasive plant species and picking up trash and debris. We will also be prepping the site for planting natives at upcoming events by raking up dense leaf litter dropped by invasive plants. Please remember to wear long pants and closed shoes! Volunteers of all ages are welcome! We will meet at the Lake Ida Boat Ramp before shuttling participants to the site. All volunteers receive a free t-shirt! We will also have waters and light refreshments for the volunteers. Come join us! Lake Ida Volunteer Day 1 was a Success! IRC would like to extend a huge thank you to all of the volunteers who made our first restoration event at the Lake Ida Parcel such a success on Saturday morning! Participants helped remove invasive plants like Acacia auriculiformis (Ear-leaf acacia), Catharanthus roseus (Madagascar-periwinkle), Melinis repens (Natalgrass), Panicum repens (Torpedo grass), Richardia grandiflora (Largeflower Mexican clover), Sansevieria hyacinthoides (Snake plant), Schinus terebinthifolius (Brazilian-pepper), Sida cordifolia (Lima), and Urena lobata (Caesarweed) from throughout this important passive greenspace. It’s amazing to see how much can be accomplished when the community works together! Future events are scheduled for March 31 and May 5. Thank you to the Community Foundation of Palm Beach and Martin Counties for funding this project and to Suzanne Fisher, Gerard Smith and Matt Reynolds from the Delray Beach Parks and Recreation Department for all of their help in organizing and coordinating these events. We would also like to thank Jim Chard for all of his support in bringing this project to life. Special thanks also go out to John Miller, Bill Bathurst and Ian Paterson for the use of their boats for shuttling supplies and volunteers at the event. The Institute for Regional Conservation meets Citizens’ Climate Lobby! 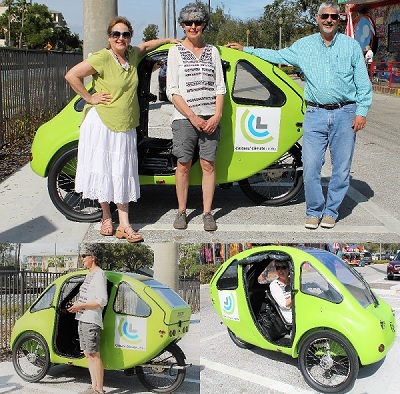 The Institute for Regional Conservation has had the pleasure of meeting Uli Nagel with Citizens’ Climate Lobby, who is peddling a Pebl tricycle for ‘Pebling for a Carbon Free Future’ along the coast of Florida and Judy Fox who is attending and documenting all events with her! She will have traveled over 300 miles by tricycle from Miami to Jacksonville by the end of the month of February with the hopes of perhaps making it to Georgia! Uli’s goal is to communicate with as many people as possible about what exactly is happening with our oceans. From her blog to her Facebook page, Uli is constantly posting about her travels, meetings, and experiences from this trip. They are meeting people as they travel by attending environmental events at schools and walking along popular areas like Hollywood Boulevard and Lincoln Street Mall. Their goal is to talk to people who are environmentally aware as well as the public. Uli and Judy are hoping to get as many people as possible to write a simple letter to their representatives in Congress about their concerns about climate change and sea level rise. Check out Uli’s travels through her blog and Facebook page here! Pebling for a Carbon Free Future Blog and Facebook. IRC observes the effects of climate change on a daily basis as we work to conserve rare plants, animals and ecosystems. Therefore, we encourage you to join a local Citizens’ Climate Lobby chapter today. You can also sign up to receive their monthly newsletter to learn more about what CCL does! If you’re interested in writing a letter to Congress about your concerns on climate change, you can use this form from the CCL website. Citizen's Climate Lobby website and Facebook page. The Institute for Regional Conservation (IRC) seeks a Chief Executive (CE) to implement policies and programs and provide critical leadership to advance IRC’s mission and long-term vision. The successful candidate will work collaboratively with the Board of Directors, staff members, volunteers and partners to design, implement and curate innovative science-based conservation programs in Florida, the Caribbean and beyond. Based at IRC's office in Delray Beach, FL, the CE will oversee a staff of 10-15 and an annual budget of more than $500,000 derived from agency contracts, grants and other fundraising. A passion for biodiversity conservation, familiarity with technical aspects of ecological restoration, and the ability to develop collaborative relationships with government agencies, conservation groups and academia are desirable characteristics for the successful applicant. To request a copy of the entire job description and application instructions, send an email to admin@regionalconservation.org. IRC’s Chief Conservation Strategist, George Gann, coauthors paper with Alan S. Weakley et al. on taxonomic innovations in the vascular flora of the southeastern United States. IRC’s Chief Conservation Strategist, George Gann, is a coauthor on a paper recently published in the Journal of the Botanical Research Institute of Texas by Alan S. Weakly et al. titled “New Combinations, Rank Changes, and Nomenclatural and Taxonomic Comments in the Vascular Flora of the Southeastern United States. 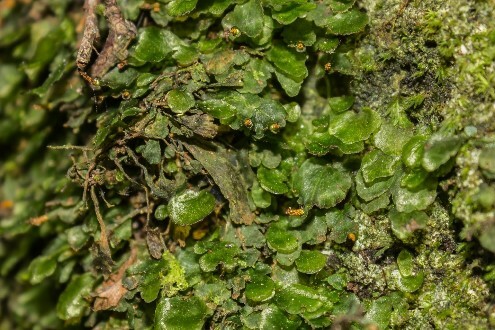 II” In this paper, Gann and Weakley rename the Florida bristle fern Didymoglossum punctatum subsp. floridanum. This species, formerly known as Trichomanes punctatum subsp. floridanum, was listed as federally Endangered in 2015 and is a species of high conservation concern. To read the paper, click here.